Good location! Quiet and classic neighborhood, and close to public transportation. Bright rooms with lots of natural light. Very comfortable bed and modern interior. Wish we had stayed longer than one day! overall excellent Very comfortable place amazing location all facilities you need for a perfect stay. The apartment was big. The kitchen was large and had basic utensils. Great having a couch for somewhere else to sit. The bedroom was large with a comfortable bed. The bathroom seemed new, had hot water and a washing machine. We did like the apartment but I would not stay again. The owner and his staff were very helpful and friendly when we asked for a baby cot. Apartment is very comfortable and with a very good distribution of the room that works with someone sleeping in the main bedroom and the living room (both have access to bathroom/restroom without waking each other up). I am very sensitive to noise and I found the place to be quiet. 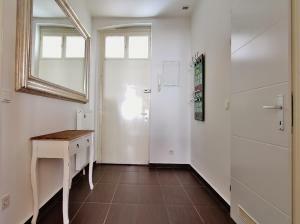 The apartment is nice and clean and has all the necessary things you need for your stay. The location is great since all the shops, bus, tram and U-Bahn lines are near. The neighbourhood is really nice and quite. There are also a lot of restaurants nearby. Customer service was great. The feeling was like at home. Warm, comfortable, clean, excelent. 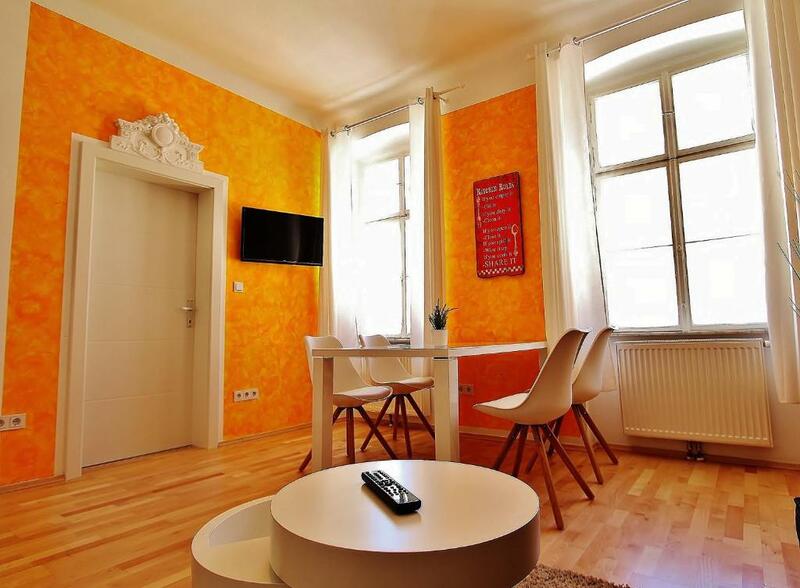 Lock in a great price for Premium Apartment Altes AKH – rated 8.3 by recent guests! Located in Vienna’s vibrant 8th district, a 7-minute walk from the Alser Straße Metro Station (line U6), Premium Apartment Altes AKH offers free WiFi access and a fully equipped kitchen. The building features a elevator, and public parking is possible against a surcharge in a parking garage opposite the building. 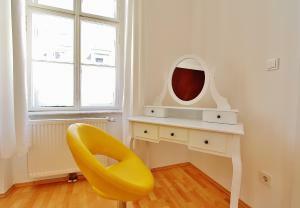 When would you like to stay at Premium Apartment Altes AKH? 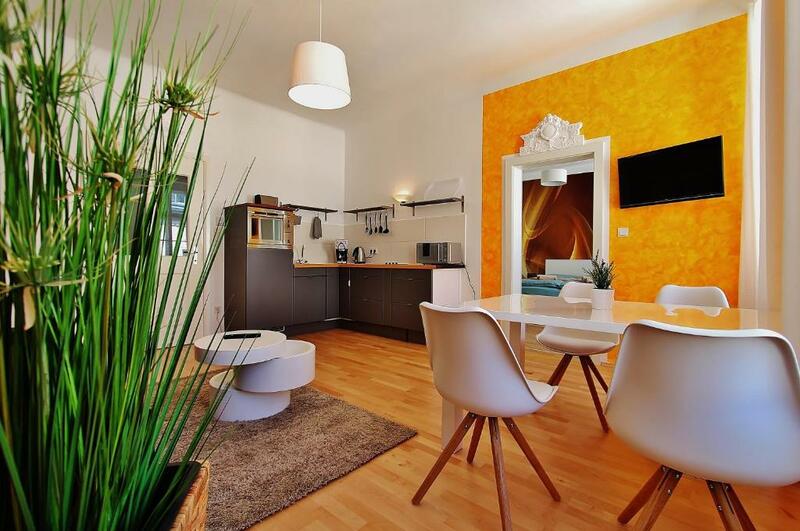 This modern and stylish apartment features a living room with a sofa bed and a flat-screen cable TV with free Netflix access, a bathroom with a hairdryer, and a fully equipped kitchen. House Rules Premium Apartment Altes AKH takes special requests – add in the next step! Premium Apartment Altes AKH accepts these cards and reserves the right to temporarily hold an amount prior to arrival. The shower drain was clogged. It backed up on the first use. This should be an easy fix, but I’m surprised it wasn’t done before we got there. The was not clean. There was no kitchen supplies such as salt/pepper, sugar, oil, kitchen paper ect. The shower drain was horrible and almost flooded the bathroom within a minute and the toilet was filthy. Area rugs were not vacuumed and debris in kitchen drawers. No dish drying rack and no washing soap for laundry. Instead there was two dishwasher tablets but no dishwasher. Lastly, we were not given keys to the door and elevator as indicated in the instructions so we had to walk up the three long flights of stairs. No one returned our inquiry asking for the elevator keys. The location and general decor was fine. There was a power point hanging dangerously out of the wall; the shower did not drain well & flooded the bathroom. No instructions for the heating system- not everyone comes from a place that has systems like this Instructions for the washing machine would be handy, esp to do quick, economical - electricity & water, wash.
hard to find a place to parking. the drainage in the shower is clogged, so the bathroom gets flooded really fast. Location and Check in were good. You have to be careful with water consumption when showering, because the bathroom will flood. However, my biggest remark goes for the quality of pillows and mattresses. Even the sofa in living room is bad (no cushions for your back). Horrible pillows with bad mattresses have left me and my husband with lower back and neck pain (no kidding). We had a problem with TV. We could not watch TV. The cost for cleaning high but the kitchen not very clean. A little far away from center. Big nice modern house, the staff was kind.. The apartment was about at least a 20min walk from the main tourist area. The host took a long time to respond to texts. The television didn’t work (we discovered it had no aerial) when I contacted the host about this he said he would get a handyman to call me so I could organise a time for it to be fixed (they never called but I also didn’t think it should be my problem to organise a time that I could be there to meet the handyman). There were other small things like no tea towel in the kitchen and no dishwasher so we had to air dry our dishes on the small kitchen bench (we also asked the host for a tea towel but he said the cleaners had left a whole paper towel roll but they hadn’t) and no floor mats for the bathroom. The shower flooded the bathroom quite badly. There was a half drunk water bottle left in the toilet and some chocolate wrappers left on the floor from the previous guest. A lot of space in the apartment. Slight point: the sofa could be changed at some point as it is stained but this is very minor. Some of the kitchen furniture could also be renewed as the doors do not open very well. - poor possibilities of parking. Only private parking available which is quite expensive (especially if you need to get in - get out several times a day). Street parking cannot be used because the property is situated in "zone" area, which allows non-residents only short-term parking for max. 2h.